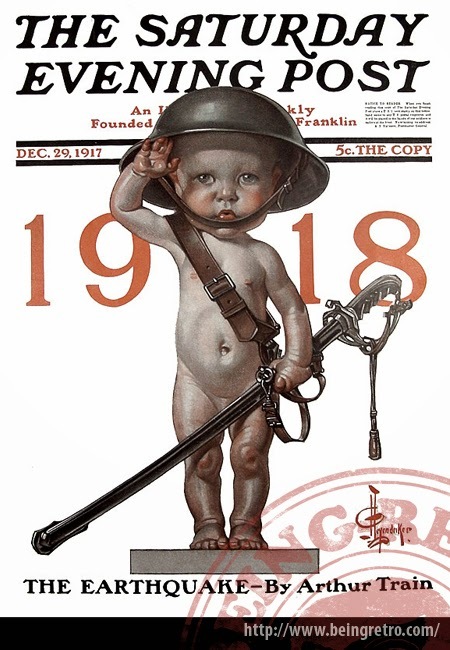 Being Retro: 1918 and this CREEPY COVER! They started training them young back then I guess. That is a creepy cover! Yow! That cover is unsettling! Oh my goodness! By today's standards that would be outlawed for sure. It's weird how our cultural norms change so drastically through the decades. If they could give him a helmet, you'd think they'd give him some pants. I have to admit, that is a little creepy. Oh my gosh that is super creepy, but he's kinda cute. I have baby mind nowadays. I think all babies, even those dressed like doughboys, are cute. Hey wow Jeremy , i just wanted to say this sure is a great looking blog you make it look so easy, its lively colourful and easy to work... Im in awe.